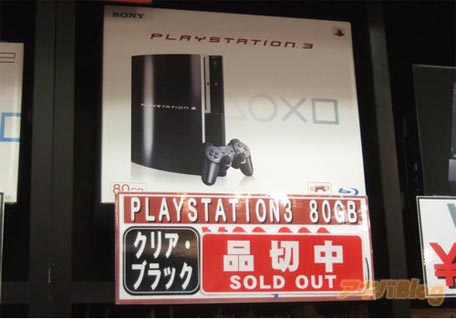 We're pretty sure someone, somewhere is enjoying the joke: "that's the first time you'll see the words 'Sold Out' attached to a Playstation 3"
Playstation 3 Stock Continues To Dry Up Worldwide. Alas, that's exactly what's happening around the world as Playstation 3 stock continues to dry out. Numerous retailers around Japan are reporting that they are completely sold out of Playstation 3 stock. One staffer claimed, "It's been over two weeks and we still haven't gotten any new stock. It's summer vacation, and there's nothing in inventory." Of course many are expecting Sony to unleash an announcement regarding the PS3 Slim at tonight's GamesCom conference.